The idea of using surgery to fix some unsatisfactory part of the physical appearance is extremely new. Unnecessary surgery is only possible with highly developed, modern surgical practices. In the early 19th century, surgery was mainly confined to amputations and the removal of external problems. Anesthesia of any kind was first used around the 1840s, which allowed surgeons to start fixing internal problems. The risk of infection was also extremely high, with the germ theory of disease first being applied to surgery by Joseph Lister around the 1870s. However, it would take quite some time for surgery to become as sterile as we know it today. Instruments were beginning to be sterilized, but there were still plenty of ways for bacteria to enter the body. Antibiotics were only just starting to be discovered around the same time, but the science wouldn't really take off until the 20th century. 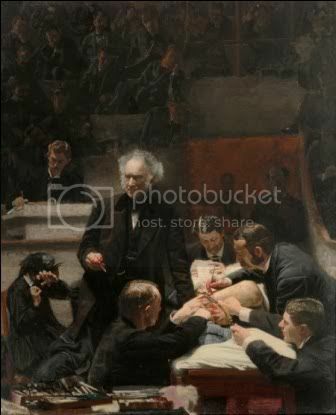 Eakins' famous picture, The Gross Clinic, shows a typical Victorian surgical scene. The surgery is performed in an open auditorium with several spectators, and the doctors themselves are wearing street clothes and working with their bare hands. Even if the instruments were sterilized, it would still be extremely easy for an infection to take hold and the poor man being operated on to die. If you survived all of that, there is still the pain that comes post surgery. Painkillers as we know them didn't really exist in the Victorian period, so for pain control a person had to turn to some sort of drug that was probably not very safe. For a point of comparison, remember when you had your wisdom teeth out? I recently had mine taken out, and even with my sophisticated, modern pain medication I was still pretty miserable for a few days afterwords. Now imagine an operation that didn't use modern surgical practices, and didn't involve modern painkillers to control post-operative pain. On the next episode of MythBusters: Fashion History Edition, underwear myths! Is it true that only lewd women wore underwear before the 20th century? Did Joan of Arc wear anything under all that armor? Find out soon! 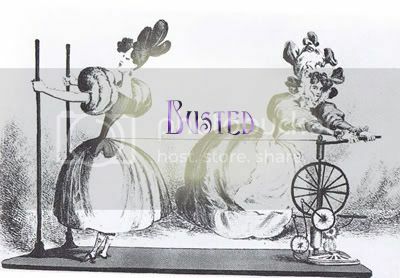 As always, if you have a myth you'd like to see busted, leave a comment and I'll research it!